There are quite few good apps which can help in backing up and restoring of iPhone data and pictures, videos etc. but a very few out of them are amazing and work pretty well. One of them is iDrive Lite which is useful app for backing up all the contacts in your iPhone and restoring them anytime when your iPhone upgrades its firmware. And when you connect iPhone to a new computer and not accept the syncing etc., sometimes your data accidentally gets lost and you are left with an empty iPhone again. 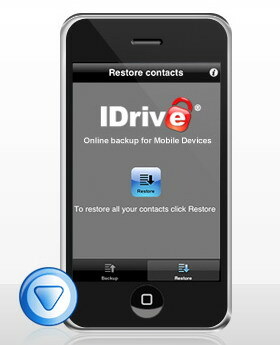 Open IDrive Lite after installing the app on your iPhone. Tap the ‘Backup’ button to backup all your contact information which includes names and mobile numbers. The contact information gets backed up. In case you lose or delete a contact information and would like to restore it, just select the ‘Restore’ tab and click the ‘Restore’ button to get back all the contact information on your iPhone. The Restore process is smart enough to leave new contacts untouched and only restore contacts that are missing. You can also share the contacts with your associates and also import the contacts anytime with the import button in the iPhone Lite app. This app requires 2.0 firmware update, and still backing up your other data is suggested while installing this app to your iphone. Thanks for the mention about that. I have Idrive lite and I’m some what nervous about how secure is it. Can you tell me how secure it is and how can I get Idrive that has web access? I wish that it had some kind of way that you can manage your contact online. Is there? What I wanted to say is that when editing a contact only english letters are supported so for us is unfortunately useless.